in which I dish about the (mostly food-related) things that are important to me. …get out of the kitchen. I was chatting with a friend the other day about the heat. She and I are in similar circumstances: our kids are the same age, and neither of our husbands is often around during the dinner hour. We are also both, at the moment, living without air conditioning; and it has been very, very hot and humid in our city these past couple of weeks. Me: You know, I am so tired and hungry by that point in the day that I can’t cope with making a salad. And I refuse to turn on the stove. I’m embarrassed to tell you how many nights we’ve had the cereal supper in our house this past week alone. My Friend: I know, it’s too much. Although I will eat a salad, as long as it has lots of cheese in it. Me: Oh, I love cheese in a salad. And croutons. Me: And a side of sausage. As grateful as I was to learn that I am not the only one who struggles with the dinner hour these days, I do recognize that, heat wave or no, the cereal supper is not something every mother would like to commit to on a long-term basis. (I’d like to mention at this point that I used to love hot weather, and I have not had air conditioning my entire adult life. Hot weather, for me, used to mean cold bubble baths and dinners that consisted of drinks on ice. Since having my children, though, I find that when the heat is on, nobody in our house sleeps well through the night; we move through the days with our energy sapped; and we find excuses to spend time in our climate-controlled car. However, I think I may have come up with a reasonable alternative. Since discovering this recipe (thank you, Sara! ), I have made it three times, varying it a little each time. The one you see here is my favourite so far – side of sausage optional. In a large bowl, whisk together vinegar, oil, and salt & pepper. 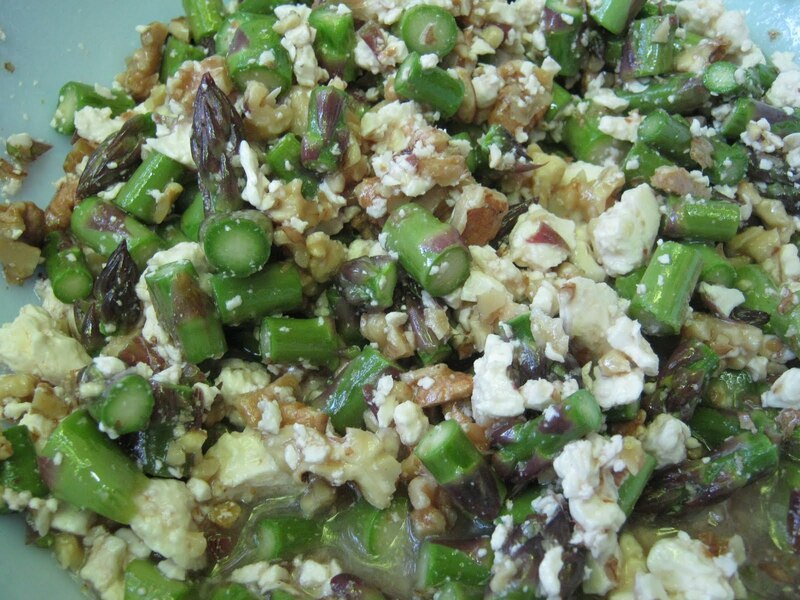 Chop asparagus crosswise, and add to bowl along with walnuts and feta. Refrigerate a couple of hours before serving. A friend gave me some freshly picked asparagus from his farm last week and I used it to make this yummy summer salad for my boyfriend last night. We both loved the tangy zip of the dressing. Throwing caution to the wind, I served it with a side of spicy Italian sausage. Yum!! Thanks for the great meal! K-Ap.s. I've seen a similar recipe in The Stop's cookbook "Good Food For All: seasonal recipes from a community garden." They add peas and quinoa in lieu of walnuts. I can't wait to try this one!